Shelagh Morris is Deputy Chief Allied Health Professions Officer for NHS England. She is responsible for a number of workstreams including improving adult rehabilitation services, extending prescribing/supply, and administration medicines mechanisms to a wider range of healthcare professions to support improved clinical outcomes and service redesign. Her first posts were in mental health as the move to community based services was gathering momentum and then in social services as part of team establishing a community rehabilitation centre. Shelagh joined the Department of Health on 1 April 2003. She was previously Director of Allied Health Professions within an acute trust and prior to that, Rehabilitation co-ordinator within a community trust. 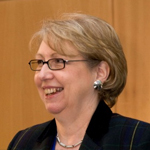 Shelagh joined NHS England as Deputy Chief Allied Health Professions Officer on 1 April 2013. She was awarded the OBE in the 2012 New Year’s Honours.